July 9-23, 2013 – I diligently continued my exercises at home. In addition I swam and exercised in my pool as many days as possible and would see Mark once a week during this time. I was on my horse 2 more times. July 23, 2013 – Dr. PZ Pearce, Champion Sports Medicine was pleased with my progress and my pain at the medial knee was gone. No need for any cortisone injection. See prior blog update #2 for story behind the medial knee pain. I’m feeling much more confident and I appreciate his encouragement along the road of recovery. 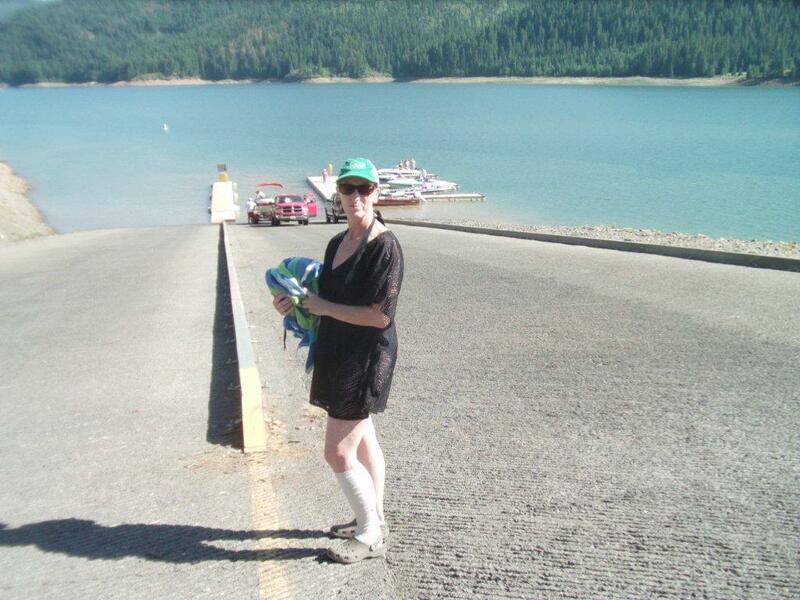 July 26-28th, 2013 – a weekend of camping and boating at the Dworshak Resevoir above Orofino, Idaho. Here is a picture of me standing on the long boat ramp. I had to walk up and down this many times over the weekend. It helped to keep my leg wrapped in the Ace wrap for support and compression against swelling. I had some swelling and tightness up the anterior/lateral muscles of my leg, but most of my residual pain was still isolated around my chronic ankle issues. All I know at this moment is suspected Sinus Tarsi Syndrome of my ankle with further diagnostics and workup in progress. I will write on that subject in near future. As this point, I still cannot walk on the side of a hill due to feeling like I would sprain my left lateral ankle. But straight up and down was no additional pain, and in fact, I felt better behind my surgically fixated left tib-fib joint than my right leg tib-fib joint when going up the hill. There was such a sense of stability and strength not seen for several years before the surgery. 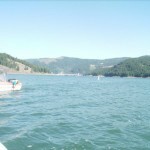 I was so pleasingly surprised and I rejoiced that this proximal tibiofibular issue is now well on the mend and I was experiencing a better time now than the prior several years of coming each summer to the lake. I wasn’t quite ready for water skiing but hopefully next summer. Since we were in a developed camping area, I had a portable microwave to warm up my rice heat packs. These always feel soothing to tight muscles. I like to wrap one around my ankle and lay the other one down my shin. The second night I was feeling very irritable in my ankle/foot so with the help of 2.5mg of Diazepam I could get some better sleep. However, I was not having any throbbing in my proximal tib-fib joint region like the years before. I also brought my exercise ball to the camp and did regular stretching over it for my back. I felt great and no Sacroiliac Joint pain. A little tightness in the buttocks from all the hill climbing and again the warm rice packs strapped around me after I rubbed essential oils in worked great for that too. 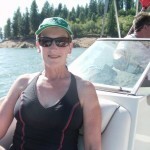 While swimming in the lake, I just floated with my water ski vest on and did constant water leg exercises twice a day for at least 45 minutes each time. I have so much more proprioceptive connection and physical feeling from my hip to mid-lower left leg after both the SI Surgery and this Arthrex TightRope Fixation Surgery. I have struggled for years with swimming face down and kicking my legs behind me. I’ve always had a feeling of why could I not control my left leg like my right leg. Not anymore, I am on the upswing. Click here for the next update blog.